Are you planning on hosting Thanksgiving at your house this year? If so, there are obviously a lot of things that you’re going to need to do in order to prepare for it, and you will, both literally and figuratively, have a lot on your plate. But one thing you shouldn’t skip over is making sure a Thanksgiving flower arrangement is at the center of your dinner table. It will help make your guests feel as festive as you do. 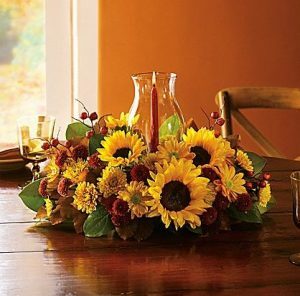 Here are some ideas for putting together a Thanksgiving flower arrangement. When creating a Thanksgiving flower arrangement, most people tend to stick with fall colors like orange, red, and yellow. And while there’s nothing wrong with that, there’s a good chance you already have those colors represented elsewhere in your holiday home decor. Instead of repeating the colors in your arrangement, try something a bit more dramatic that will stand out from everything else you already have decorating your home. The vase that you choose for your Thanksgiving flower arrangement should work well with the place settings you plan on using. You don’t want to plop the vase down on your table only to realize that it doesn’t fit the theme you have going. So consider which vase you will use before you start assembling your arrangement. You don’t want to force people to look over or around your Thanksgiving flower arrangement. People enjoy catching up while they eat on the holiday, so make sure your arrangement doesn’t get in the way of that. It shouldn’t be too tall and serve as an obstacle for your guests. Do you need help putting together the perfect Thanksgiving flower arrangement? Dallas House of Flowers can help! Check out some of the arrangements we can provide for you or call us at 214-339-1612 today to learn more about creating a custom arrangement specifically for you!